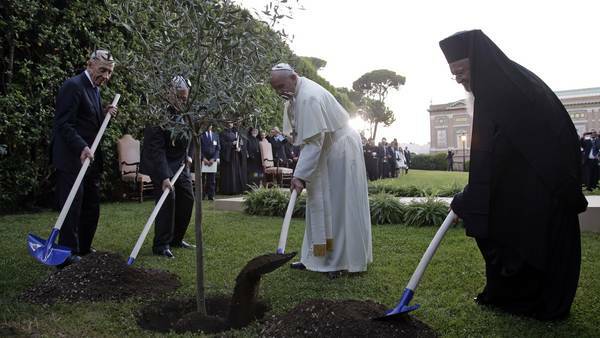 VATICAN–Just moments after Israeli President Shimon Peres and his Palestinian counterpart Mahmoud Abbas helped Pope Francis plant an Olive Tree in the Vatican Garden yesterday, the Jewish news outlet The Fiddler reported that peace had broken out in Israel. Surrounded by Palestinians and Israelis holding hands and giving each other piggyback rides, Israeli Prime Minister Benjamin Netanyahu Skyped Pope Francis to inform him that everything had been a misunderstanding, and all was now settled. But less than one day after receiving news that every single Middle East conflict had been resolved, the magic Olive Tree that Francis, Peres, and Abbas had shoddily planted into the ground toppled over with a gust of wind, instantaneously causing a chain reaction of violent outbreaks all across the Middle East. Speaking to reporters from the Vatican Gardens, Francis said that he was saddened to hear of the news, going on to tell the press that he had received another Skype from Netanyahu showing the Israeli Prime Minister in a fist fight with Hamas leaders. Both sides are now blaming the other over whose shoddy work caused the fall of the tree.